The subject of relative risk is complex and my thumbnail sketch is necessarily oversimplified. for those of you who know much more about these things than l do, l apologise. During my years as a family doctor l would be regularly asked about the chances of success of certain operations or more darkly, the questioner's chance of surviving them. This is always difficult to do because you cannot extrapolate from general risk to that of the individual. If you take a group of 1,000 people and you know that there is a 1 in 20 risk of something unpleasant happening to them then you can reasonably address the group and tell them en masse that you would expect somewhere between 10 and 30 of them to have that mishap (l know that those numbers depend on a whole lot of unspecified variables but that statement is a fairly workable rule of thumb). However if one of them puts up a hand and asks, "will it affect me?" then you cannot say, for that person the risk is all or nothing and you can never point in advance to the specific person who will suffer. This is always a problem when advising people about such things and causes a lot of distress. The other aspect of relative risk is the headline that often appears that says things like "people who drive cars have twice the risk of being involved in accidents than people who drive spaceships". While this is a facetious example it is not unlike what is seen in the media. You need to know how great is the smaller risk before you can have any idea whether you should worry about it enough to change your behaviour. lf the risk of crashing spaceships is vanishingly small then double vanishingly small is not very much risk at all. If the smaller risk is 1 in 2 (That event will happen to half the people who do whatever is being discussed) then double that means that it will happen to everybody and it is probably worth taking steps to change things. These things may seem abstract and esoteric but we all have to take judgements based on relative risk every day. Even crossing the road needs the instant judgement about the likelihood of being squashed by the oncoming vehicles. This is done subconsciously in a split second whereas the questions about risks of allergy need more careful weighing. ln the context of allergy, for example, the nut allergic person needs to do some kind of mental relative risk assessment if they buy a cake from one of those unhelpful shops that say that some of their bakery products may contain nuts. Do they play absolutely safe and avoid all such products or do they take a calculated risk in pursuit of the perfect doughnut. This is a very difficult one to answer and depends on lots of factors including the individual's experience of allergy, their feelings about it and the decision about which action gives the preferable payoff. These are all determinable only by that particular individual in that special circumstance. Slightly off the point, but of interest, is the medical sleight of hand that allows us to consider that our relative risk of something is reduced if we take such and such a drug. It may be but we have no absolute proof. for example I have high blood pressure, high cholesterol and borderline diabetes. Prescribed tablets control these and allegedly my risks are now the same as someone whose blood pressure, cholesterol and blood sugars are naturally normal. This may be so but they are artificially so in my case and I cannot be considered in the same group as someone who is naturally like that. 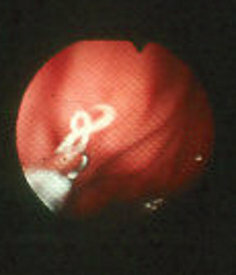 Anisakis simplex is a common cause of allergies in certain countries that eat raw or pickled fish. Do you avoid such food in order to miss out on the few cases of anisakiasis that occur each year when people eat the live parasite and do you consider the much higher risk of allergic reactions to it too high? Anisakis simplex is a roundworm that as an adult is a parasite of sea mammals. It has a complicated life cycle. The adults of anisakis simplex are found in the stomachs of whales and dolphins. fertilized eggs from the female parasite pass out of the host with the host's faeces. These then develop into larvae that hatch in the seawater. The larvae are eaten by copepods (small shrimp-like creatures) and other small invertebrates. The larvae grow inside the host animal and when they have developed to the next stage pass out and infect the next host, a fish or a squid. The larvae may burrow out through the bowel wall into the muscles of the second host. These parasites are known to occur frequently (well over 40% and in some studies up to 100% of the fishes studied) in the flesh of cod, haddock, fluke, pacific salmon, herring, flounder and monkfish. 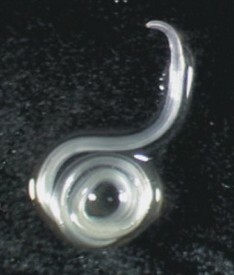 Some evidence exists that the roundworm larvae move from the bowel to the flesh if the fish hosts are not gutted promptly after catching. Anisakiasis (the disease caused in humans by anisakis simplex) is most frequently diagnosed when the affected individual feels a tingling or tickling sensation in the throat and coughs up or pulls out a roundworm. Symptoms occur from as little as an hour to about 2 weeks after consumption of raw or undercooked seafood. With their front ends, these larval roundworms from fish or shellfish usually burrow into the wall of the intestine and occasionally they penetrate the intestinal wall completely and are found in the body cavity. The worm has hooks on it's mouthparts and in the host's intestine it can detach itself and move about, reattaching itself to other sites, anisakis simplex rarely reaches full maturity in humans and is usually eliminated spontaneously from the intestine within 3 weeks of infection. Worms that die in the tissues are eventually removed by the host's scavenger cells but can cause inflammation that can mimic appendicitis or more serious conditions. This is fortunately rare with only 8 cases appearing in the literature from Spain, the source of my information on this subject. However at least 2000 cases (mostly minor) occur in Japan amounting to 95% of the annual world total. In 1989 a case of anisakiasis was described which was accompanied by an anaphylactic reaction. Just 12 months after that, in Holland, a case of acute urticaria was described after the victim had eaten mackerel. 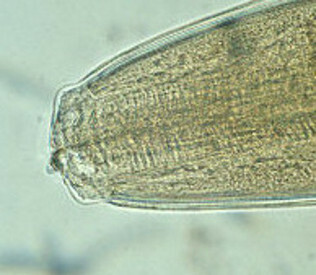 For the first time the cause of the allergy was shown not to be the mackerel itself but a larva of anisakis simplex living in the fish as a parasite Since then, many of the allergic reactions to anisakis simplex have been described in patients with acute urticaria associated with the eating of fish. Urticaria ǐs not the only allergic symptom due to anisakis simplex and one case of conjunctivitis and two cases of work-related asthma have also been reported. ln Northern Spain anisakis simplex is considered to be responsible for 10% of cases of anaphylaxis, and here 45% of patients with urticaria had antibodies to anisakis simplex. This makes this roundworm an important cause of allergic problems. Positive skin tests or specific immunoglobulin E (IgE) detection tests to anisakis simplex occur in 16% to 28% of the symptom free population and this is likely to be due to past exposure to the live parasite. Live parasites are needed to produce an allergic reaction in most people but here the important word is "most". This would imply that a goodly proportion of people in Spain have been exposed to the live parasites but have probably not noticed them or been bothered by them. Adequate cooking and freezing kills the parasite and prevents the disease of anisakiasis. When fish is not going to be cooked it should be frozen before pickling or making it into sushi. The larva is a resilient animal and can survive for 50 days at 20 degrees C and for 2 months in vinegar, potentially making pickled herring an interesting culinary experience. Allergy to anisakis simplex is a different problem. The proteins of the parasite that cause the allergy do not lose their harmful capacity on freezing and this treatment method should, therefore, not prevent the reaction. Nonetheless most patients diagnosed with allergy to anisakis simplex have no problem with frozen fish, which must be assumed to contain dead larvae. This has to be considered in the light of the disease anisakiasis and the interconnected problem of allergy to that animal. It seems that, as live infestation is usually necessary to cause the allergy it may be avoided by making sure that all fish was previously frozen or well cooked. As around a quarter of Spanish people have antibodies to anisakis simplex then they are likely to have been exposed to it alive. As allergies to it make up a high proportion of Spanish allergy clinic patients then it seems reasonable to attempt to avoid anisakis simplex in its live and more dangerous form, This would be especially so if you were a person with allergic tendencies. Sushi or not sushi? - Sorry, but its not sushi for me.